In the Fall of 1993, I took a sabbatical leave at the famed Departamento Nacional de Obras Contra Secas (DNOCS) [National Department of Works Against Droughts], in Fortaleza, Brazil. This work led to several papers on drought hydrology, among them, Characterization of drought across climatic spectrum and Management of droughts and floods in the semiarid Brazilian Northeast - The case for conservation. While in Fortaleza one evening, I went out to dinner with a former classmate from Colorado State University who happened to be in town for business. He had a very good reputation in stochastic hydrology going back to his years as a Ph.D. student. Curious to find out what he was up to, I said: "José, what are you doing these days?" He answered: "Urban hydrology." I said: "That is something new to you, isn't it? He replied: "It is simple. All you do is build a channel in the middle of the street, and drain the water as fast as you can." I said: "That's the way it used to be. Nowadays it is a lot more complex than that. Urban hydrology is not just drainage; it is also retention." 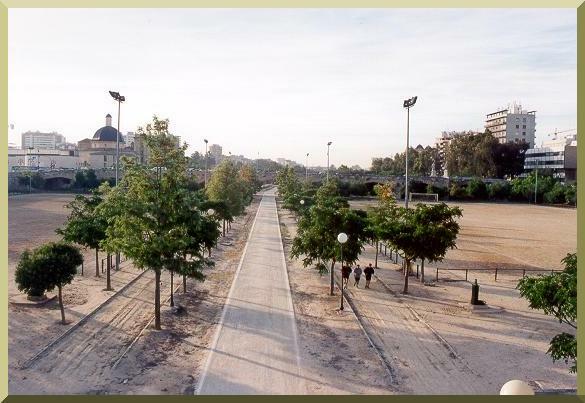 The Turia river, in Valencia, Spain, designed for recreation.